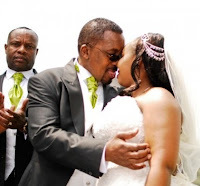 Monday, August 27, 2018 - Boiseterous city preacher, James Maina Ng’ang’a, of Neno Evangelism, bragged to his congregants about the amount of money he paid as dowry for his second wife, Mercy. Ng’ang’a married a youthful and curvy lady after his first wife died under mysterious circumstances. He called his well endowed wife to the pulpit and told her to turn around so that his congregants can see her killer figure. He bragged that he paid over Ksh 3 million as dowry. He further alleged that the wedding plus dowry was over Ksh 6 million. Listen to him brag in this video towards the end.